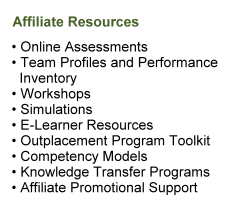 RGi's affiliate program is a resource for consultants and human performance professionals. It is designed to provide a broad platform of offerings to help build and sustain an external practice and internal development programs. It is not a pay-per-sale, pay-per-click, or pay-per-lead program. The program's sole purpose is to support client engagements and organizational initiatives through an innovative, easy to access, dynamic resource center. RGi offers a full range of products and services from single toolsets to total client solutions.